This top has a lovely print with a little bit of pink in it. I thought the pink singlet would be nice with it, and choose some pink accessories too. 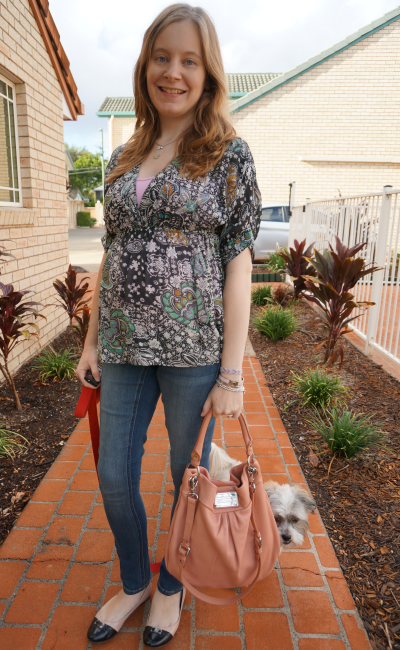 Last worn: French Connection print top, maternity skinny jeans, two tone flats, Marc by Marc Jacobs Hillier hobo. Another simple, casual outfit! So glad I bought these shorts, as although it's officially autumn now the weather is still nice and warm. Today we spent some more time at baby stores and picked out and picked up baby's crib. So excited to have the first piece of nursery furniture! I kept going around and snapping pictures of cute nursery ideas too. We won't be painting baby's room as DH is quite minimalist when it comes to decorating, but there are lots of cute accessories and cot sets. I'm in love with a little Disney Winnie the Pooh set at the moment, it's adorable! Sadly, quite expensive. Now we have the dimensions for the cot though we can start thinking more about colour schemes and themes, so much fun. 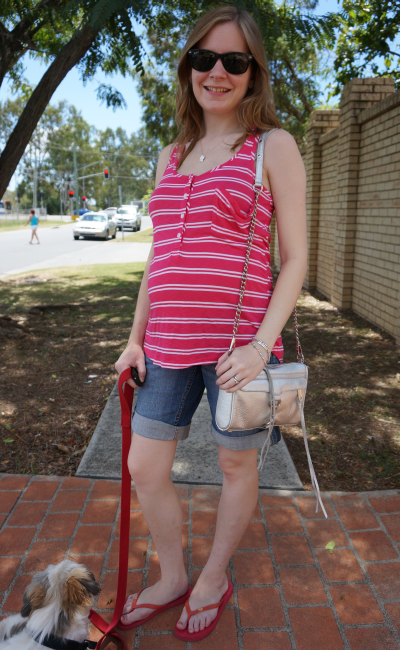 Last worn: Ray Ban new wayfarers, Splendid striped tank, maternity denim shorts, Roxy thongs, Rebecca Minkoff silver mini MAC. 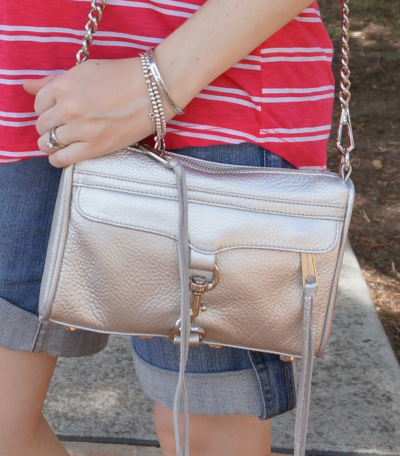 Linking up with Sunday Style, Monday Must Haves today. Gorgeous jeans and denim shorts! Are you going to do some baby posts on your blog? I'd really love to see the room/crib etc. I'm baby mad at the moment, I think it's because I'm 27 so my biological clock is getting the better of me. Haha. oh, yo ulook very pretty and sweet) Lovely snapshots as well! Great looks, Hope you keeping well and I'm so jealous of your sunshine oh and your silver RM bag :P gorgeous! Haha yes I'm lucky to get to wear summer clothes an awful lot! Love that French Connection top, Mica. Very envious of all that sun! you have the cutest maternity tops!! the first FC one is so lovely! 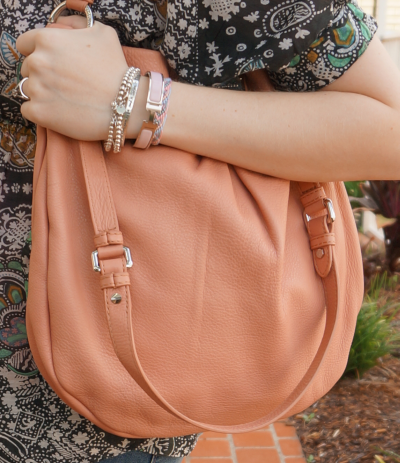 Love all of your bags! And the print on your first top is so sweet! You look lovely, and I love your gorgeous flats! OMG! Congratulations!! Love the styling and no baby bump in site quite yet. Love the Marc by Marc Jacobs handbag! Awww, the crib is the start of things! You're going to have fun putting the nursery together Mica. Share with us! Share with us! HaHa Love your printed tops. So cute. Haha! I did take a 'before' video of the nursery https://www.youtube.com/watch?v=RZvjVG5I_4A I'll try to take an after video to share too! Beautiful RM purse! Such a cute laid-back outfit! Both are lovely and comfy look. I love your first look and your arm candy.